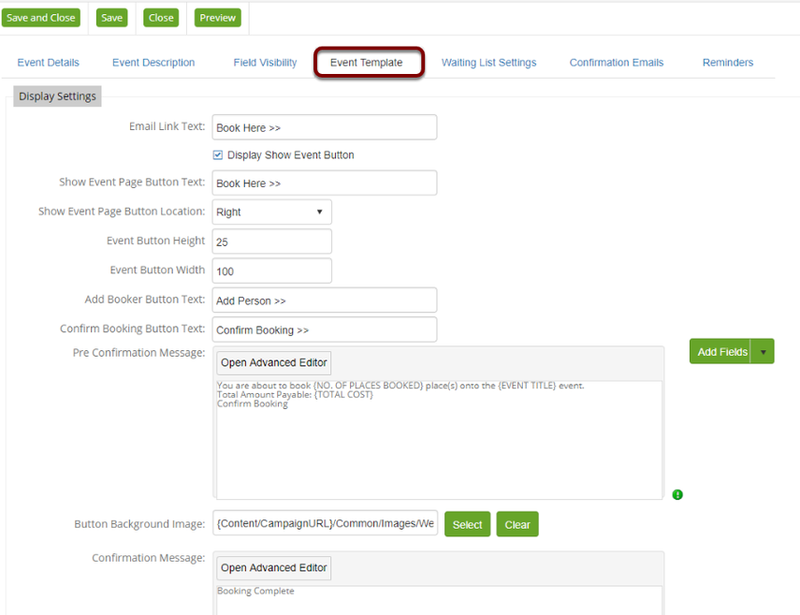 CommuniGator’s Event Management Module allows you to handle events from booking to attendance, all from within the CommuniGator system. This allows for bookings to be made directly from your website, emails, or manually take bookings over the phone. These can be both free and paid for events which can link to credit card payments made by Paypal. Confirmations, invoicing, reminders, waiting lists and attendance follow ups can all be handled within CommuniGator’s familiar interface. 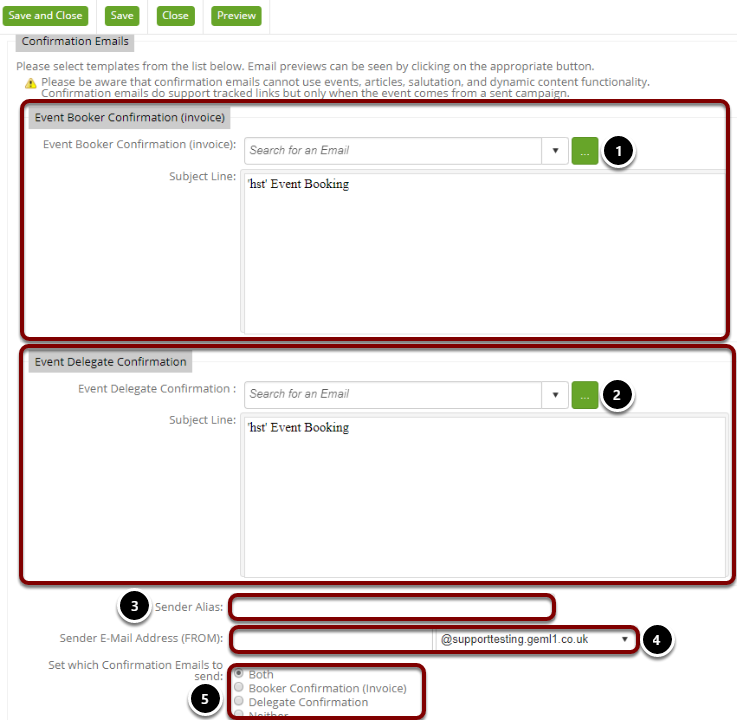 To access the Events list, select Events -> Event Setup. 1. Select 'Add New Event'. 2. Enter a Name for the Event. 3. Add a Description for your Event. 4. Choose a Start and End Date for your Event. 5. 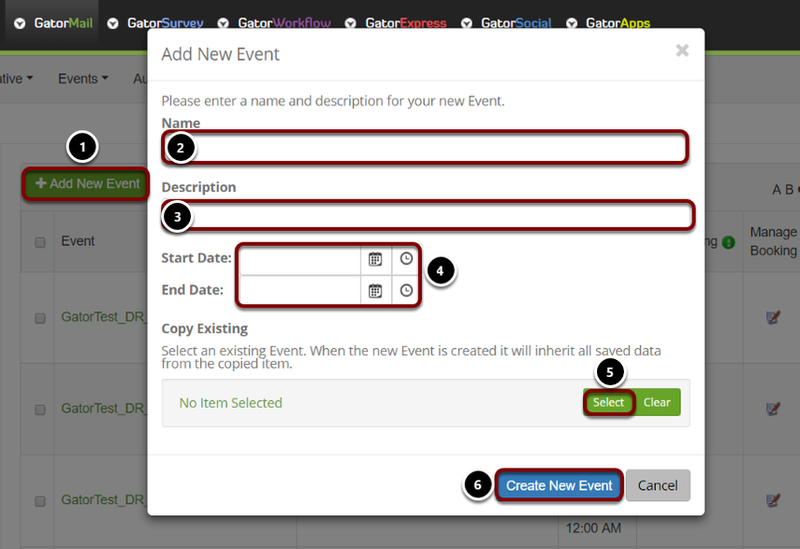 You also have the option to choose from an existing Event, in-case you want to use an event you have made before. Once you have filled out the basic event details you will be taken to the screen above. The Event Details Tab is the default starting tab. There are many options presented to you here but only those around event name, times, etc are required, plus any others that you may like to use as merge fields within event invitation, confirmation emails, and reminder emails. 1. Setting your event to 'Active' will make it bookable and live within your iFrame if you are publishing events on your website. 2. The Event Landing Zone URL allows you to select which domain you want to appear in the URL of the event page. The Event URL can be added to a private email and sent to a recipient manually outside of an email campaign. 3. Event Start Page - If this is set as Booking Form it will take you straight to the event form. If this is set as Landing Page it will take you to a long description of the event and then onto the booking form. 4. This section allows you to integrate a meeting with a GoToWebinar. This section allows you to choose the payment options for your event. 1. Select the payment option for your event. We recommend Paypal for paid events due to security reasons. 3. Enter your VAT code. 4. To add a new location select the green + button. 5. Set a total number of places for your event. Once the total has been reached and people are still trying to book on, you can enable a waiting list. Clicking on 'Show Advanced Options' expands the section to show Advanced Details, Discount Details, and Categories. 1. Set a boundary of when delegates must book by. 2. Select who manages the event. 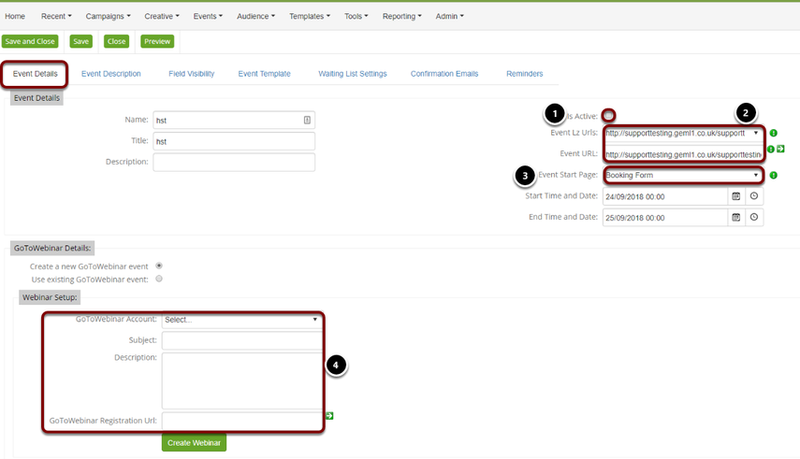 Clicking the plus button will allow you to add new event managers, including email address and contact numbers. 3. Move the event into one of your existing folders. 4. If you wish to have a discount system for large groups of people then you can set it up here. 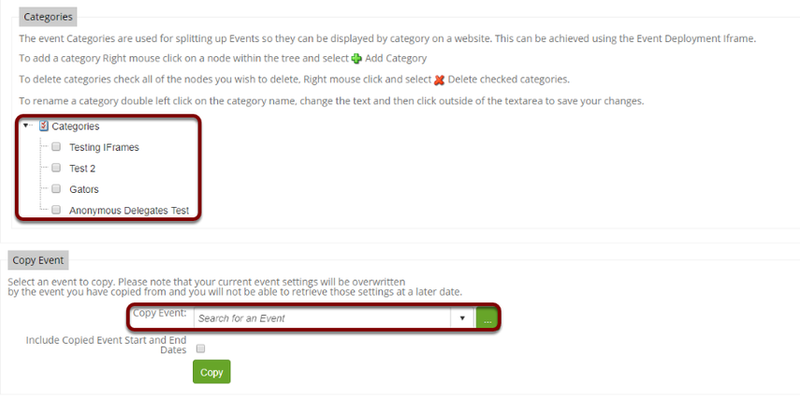 Categories are mainly used for when adding events to your website, so you can choose to assign the event to one or more categories. You also have the ability to copy an Event. Here you can add images and text to your Event to make it look appealing, and display the information you wish your customers to see. 1. Add an image to your event. This is usually your company logo. 2. Add a short description. You can edit the format by selecting 'Open Advanced Editor'. This could be an Agenda for the day. 3. Add a long description. You can edit the format by selecting 'Open Advanced Editor'. Please Note: Pasting content into the description boxes will not maintain any campaign tracking content. To do this paste your text into the Advanced Editor. You are able to set up custom content for your event. This content will be displayed on the first event page. Custom content will automatically be added after the long and short descriptions, if they have been selected. 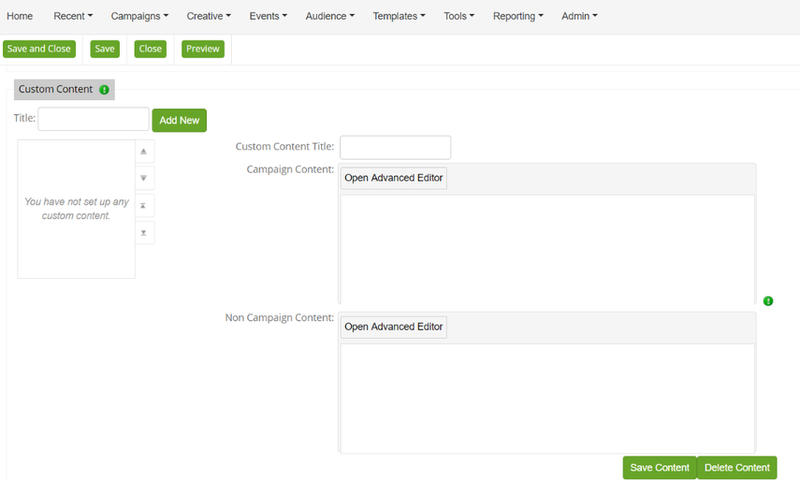 For each custom content you can set up campaign and non-campaign content. 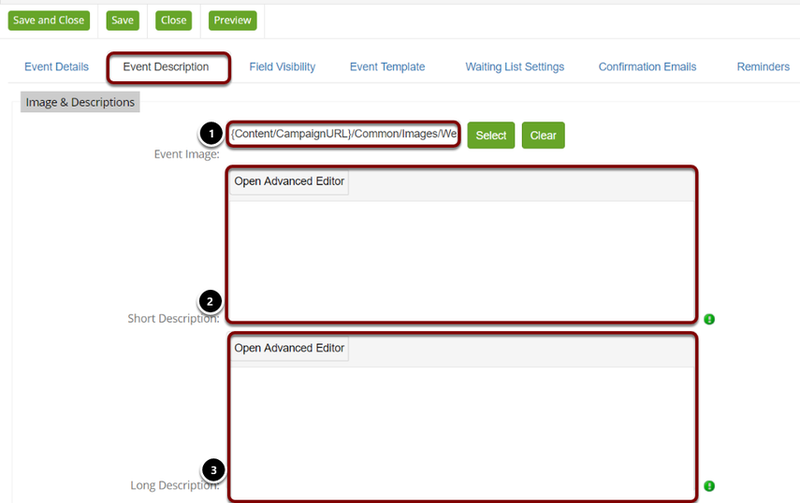 Campaign content will be displayed when the event has be viewed via a campaign and the non-campaign content when not. You can re-order the content using the arrows in the listbox. If you would like to add links to documents or other websites within the booking process then select them here. 1. 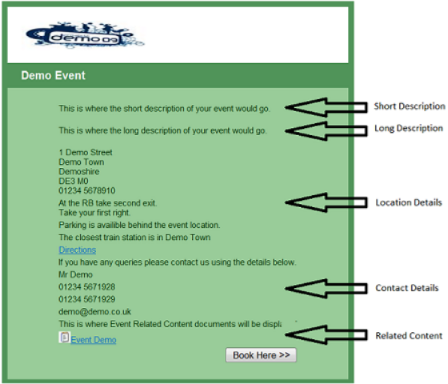 Display Field Visibility allows you to display the information that you have previously entered on the 'Events Details' section on the first page of the booking form for the recipient. By selecting each tick box this will enable each option from 1 - 5 to be visually displayed on the first page of the booking form. 2. Business Objects Attributes are contact fields which you have created as well as a few default fields such as 'First Name'. 1. 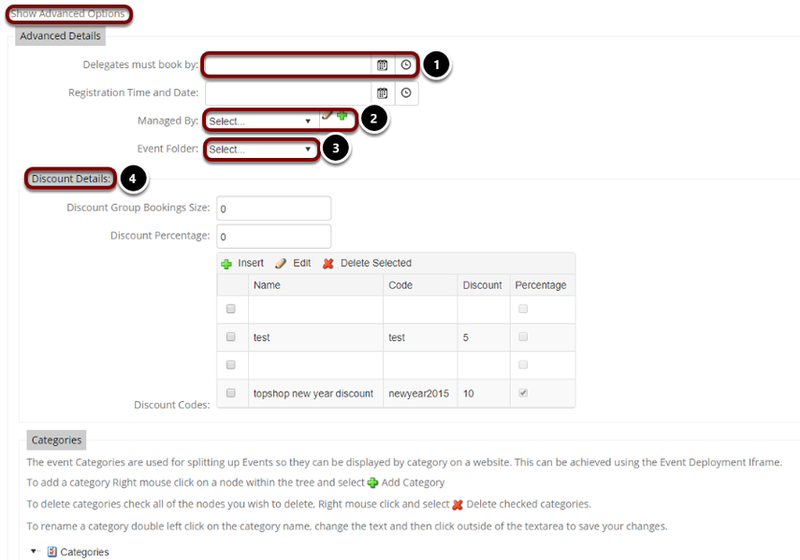 Here you can re-order your fields for how you want them to appear on your events form. 2. 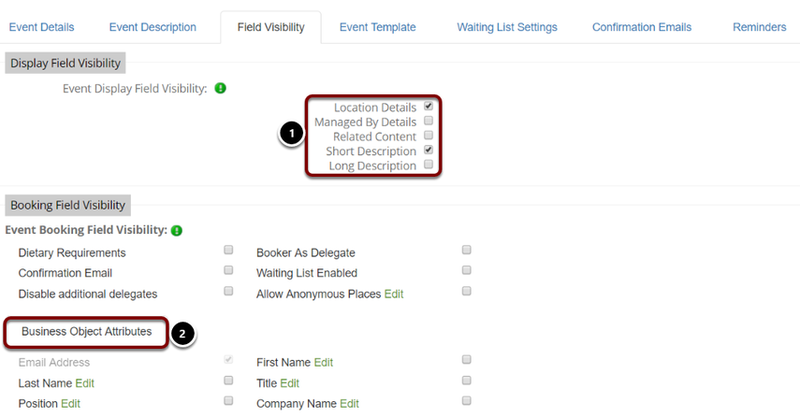 Control what fields you want to be mandatory for an event or set up additional validation for specific booking fields. In this tab you can choose from a multitude of templates and adjust the basic settings. You can add buttons, confirmation messages, email links and more. You also have the option to pick from default or custom templates. 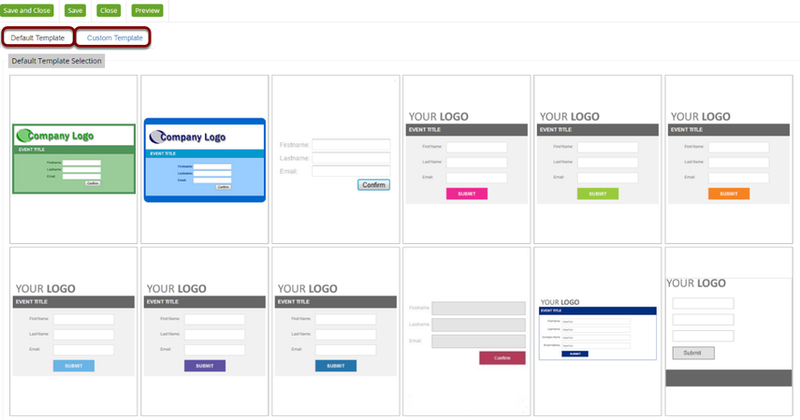 You can build your own custom templates or contact your Account Manager to have our design team make them for you. In this tab you have the ability to customise your waiting list form if you have enabled them to appear. 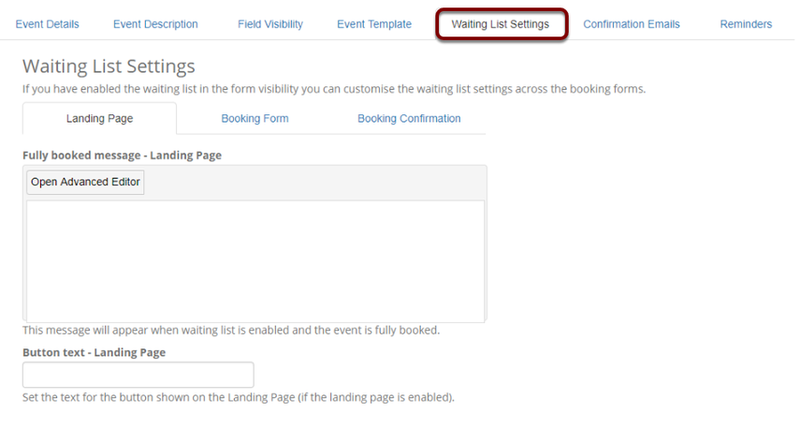 This feature is for when the total bookings are exceeded and any further bookings are put on to a waiting list. This can be a Landing Page, a pre-cursor to the booking form, and a Booking Form. A booking confirmation message is also available for the end of the booking process. Confirmation Emails are useful for when a customer has booked on to your event, and you wish to confirm their booking. 1. The 'Event Booker Confirmation Email' should be used to send to the booking customer if it is a paid for event. 2. The 'Event Delegate Confirmation Email' is sent to other members of the customer company who have been booked on to the event but are not paying the fee. 3. You can provide a Sender Alias which appears instead of your email address. 4. Add a Sender Address. 5. Choose whether to send the Booker Confirmation, Delegate Confirmation, both or neither. Select whether you want to enable a Confirmation Opt-In. This allows you to ask the customer if they want to opt in to communications from you. Here you would select a Confirmation Opt In you have created. Reminders can be set to send out an email to all delegates a number of days prior to the event. They can also be set to go to any email address or distribution list, so may be used to send delegate lists to trainers or speakers. To create a Reminder select the 'Insert Reminder' icon. You will be taken to the above screen,where you need to insert a name for your Reminder Email. Once it has a name, select 'Add'. 1. Give the email a name. 2. Select the Send Method. Usually Date is appropriate as you would send the email after a certain date. 3. Set the Date for the email to be sent. 4. Select the Reminder Audience, whether this is a Single Person or a Group of People. 5. Insert the First Name, Last Name, and Email of the Person Responsible for the Event. 6. 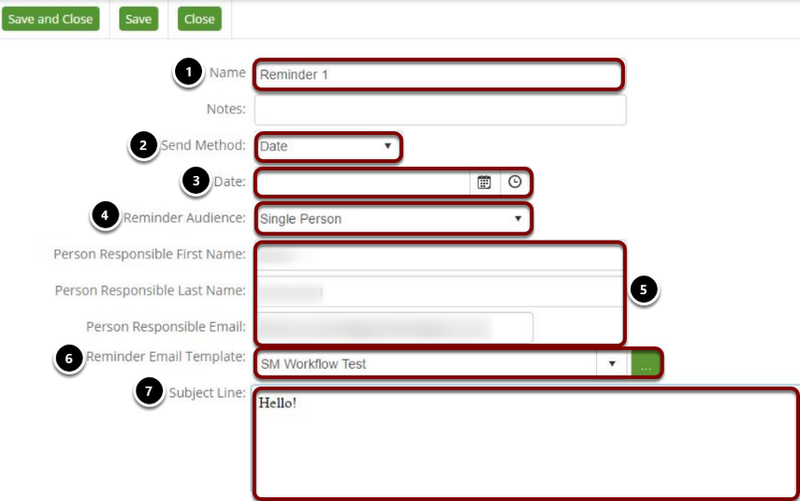 Select the Reminder Email Template. 7. Enter the email Subject Line.